Simply Cellular® anti-Mouse for Violet Laser | Polysciences, Inc. The Simply Cellular® anti-Mouse for Violet Laser standard features microspheres comprised of a proprietary matrix that exhibits low autofluorescence with violet excitation. Beads are suitable for labeling with mouse Abs conjugated with violet fluorochromes, and for use as a compensation or general reference standard for detectors off of the violet laser. Beads are also suitable for use with other fluorochromes / detectors, e.g. 488nm, 633nm. 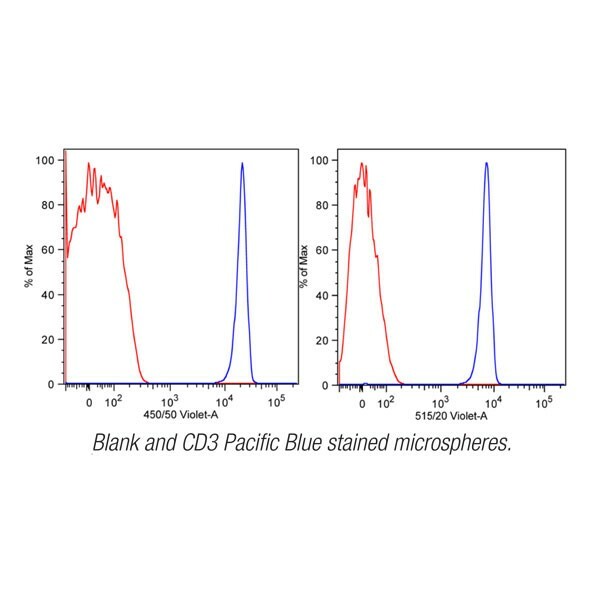 The Simply Cellular® anti-Mouse for Violet Laser standard is supplied as 2 populations: 1 blank and 1 high-binding anti-Mouse IgG (Fc specific) population. They are supplied in aqueous suspension containing ProClin®. For more Flow Cytometry Resources, visit the Bangs Flow Blog.